Apps for smartphones are all the rage. Many product manufacturers are providing apps as part of the package. What makes this particular app cool is that it is part of a wireless telemetry system offered for remote controlled models. It used to be that a modeler was satisfied just to have reliable communications from his transmitter to his airborne receiver. That is especially true these days when the total value of an airplane, engine, and associated hardware can easily exceed $2,000. The guys who build incredibly detailed scale aircraft that reflect many hundreds of hours of building, painting, and detailing a WWII era B-17 bomber or a twin-turbine F-15 model put it all on the line the moment the plane is put in motion. Any failure of the receiver to properly decode the transmitter's signal can - and often does - result in total loss of all their effort. RF interference has in the past been the most prominent cause, either from nearby unintentional radiators or from dopes who switch on their transmitter operating on the same channel (the FCC reserves 50 frequencies exclusively for airborne R/C). Fortunately for the modeling community, sometime around the turn of the century (21st, not 20th) some smart engineers figured out how to build reliable radio control systems that operate in the 2.4 GHz ISM band using spread spectrum modulation. The quantum barrier to be tunneled over/around was sufficient range while keeping within the FCC's maximum power output specification. Redundant receivers with separate, orthogonally oriented antennas provided the largest part of the solution, but the availability of more sensitive receiver ICs played no small part. Frequency hopping and direct sequence spread spectrum is being used by competing manufacturers, and a couple have even implemented a combination of both; I'm not sure how the processing gain is calculated in the former case. Now I'll return to the telemetry and smartphone app part of the story. A couple years ago R/C system manufacturers began offering receivers and stand-alone airborne transmitters that talk back to the earth-bound transmitter in the pilot's hands. Onboard sensors report battery voltage and current (complete with low battery warning alarms), engine/motor temperature, RPM, altitude, airspeed, motor power for electric-powered aircraft, signal quality, and a few other functions. Parameters display on the large LCD screens that are a part of the more expensive transmitters (some more than a 1kilobuck). The entire flight can be recorded for playback later. 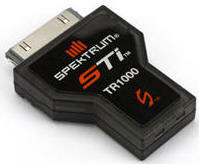 The Spektrum™ STi™ Telemetry Interface for iPhone®, iPad® and iPod touch® is a stand-alone receiver that does not require a suitably equipped transmitter to operate - it simply plugs into your device. That allows a helper to monitor critical functions for you while you concentrate on flying the airplane. It is not unusual on sophisticated model aircraft to require an assistant to operate auxiliary functions like flaps, bomb release mechanisms, machine gun firing, brakes, etc., so having a helper for monitoring onboard conditions is not a new concept. Do I have one, you might ask? No, not yet. Time just does not permit me to justify the cost at this time. As soon as some company from China buys RFCafe.com for a couple million dollar$, then I'll be getting one right away. It would be nice to get one to do a teardown report, though.